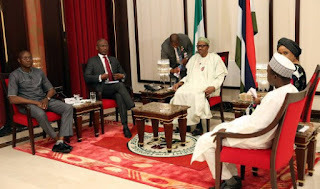 President Muhammadu Buhari tonight host his maiden Presidential Media Chat since assuming office on May 29 this year. The challenges confronting Nigeria – insecurity, the economy, corruption, dearth of infrastructure – are still largely the same issues the last administration grappled with. Mr. Akintemi fired the first shot. He asked the President how long the honeymoon with Nigerians would last. How are we doing with the fight against corruption? The President responded, saying the country was doing very well considering the circumstances. "We have documents showing Nigerian crude oil was lifted illegally and proceeds are put into personal accounts instead of Government account. "We are in court with suspected corrupt persons and we cannot comment until the court are through. "We can only appeal to Nigerians to be patient." "Our constraint is that the accused persons have to defend themselves in court to defend themselves. So, we cannot release their names to the public until the issues are completed in court. Whatever we recover will be presented in court. "The documentation in court include bank statements and documents from Customs Service that are to be presented in court. Until then, we ask Nigerians to have patience." "We have documents showing where monies have been lodged." Is there need to rejig the EFCC, ICPC? "We have to be very sure of the documents we get and we have to cross check records sometimes across countries and in the EFCC. "Those who were engaged in the theft of oil were people of substance and have the wealth to hire the best of lawyers to defend them. "We need to submit fool-proof documents to succeed in prosecution. "How many people have ICPC prosecuted in the past? That is why we are being thorough now. "By the end of first quarter of next year, we would be in a position to tell Nigerians how far we have gone. I swore by the Holy Koran to defend the country's constitution and the law. So, we will not put any body above the law." "The problem of NNPC is the involvement of international institutions such as shipping lines and financial institutions. "We would ask for the cooperation of other countries to get monies lodged from sales of oil in different accounts and not that of the Federal Government." "I have declared my assets four times in the past. You have the constitutional right to go to the relevant government agency to go and seek for it. "They were deposited at the Ministry of Justice. If Ministry of Justice cannot produce my asset declaration form, then they too should answer some questions. "Why me alone, why not others who were governors and Ministers as well. I think I don't have to ask them to give, it is your constitutional role." People on your party are being shielded from investigation? "I don't tolerate corruption and I did not pick anyone that will corrupt my government. "It is the right of Nigerians to take them to court. I have not taken anybody who is facing corruption charges." "I cannot make the mistake of appointing anyone with corruption. "Whoever is found to be corrupt would not only be sacked but prosecuted." "We want to be sure that the girls are complete, safe and sound before we attempt any form of negotiation on the girls. "We are still keeping our option. If a credible leadership of Boko Haram is ready for negotiation without any condition we are ready to listen to them." "We have about two million IDPs, over 70% are women and children. Over 65% of the children are orphans. "Some Nigerians contributed money, about 25 Billion Naira, a committee was set up to utilise the funds. "Within the week I was sworn in, I went to Chad and Niger. "I was impressed with the goodwill they gave Nigeria on this issue. "The G7 has sent training teams, and have given us some military hardware. "We are more concerned with the orphans, a chance for them not to lose the opportunity for education. Some progress is being made on the ground." "The Benin IDP camp is a good intention that went sour. "Despite the problem, the Edo State Governor, Adams Oshiomhole, was kind enough to have found school for the children. "The Federal Government is aware of the situation and ready to take them to where they came from." ...on Shiites/Military clash; why the silence? "I was in touch with the governor of Kaduna state and the President of Iran talked to me about it. "We have a system of investigation as a government and as the head of the federal government, I have to wait for official report before I comment. "The Police and the SSS are doing their own role of finding out what happened. "In any incident where lives and property were lost there is a standard way of doing things and people would be asked to come and give evidence. "How can any group create a state within a state? "I saw a clip in which some dissidents were virtually hitting the chest of Generals." "I expect the Kaduna State government will bring the report on the inquiry because the crisis happened in its domain. There are all sorts of allegations. So, we just have to wait for the report." "The President of Iran spoke to me about the situation. But, I told him that as a government we have a system we must follow. "As the head of the Federal Government, I told him I will have to wait for the official report from the Kaduna State government from their investigations. "To be fair to the both sides, we have to wait for the report of the inquiry." "When I said that the war has been technical won, I said the capacity of Boko Haram to unleash attacks from camps and barracks have been stopped. "If Hijab is found to be a problem, the government will have no option than to take a decision on it. The people will have to consider between it and their security." "If this thing (suicide bombing) continues, Hijab would have to be banned." "I said the capacity of Boko Haram to attack institutions or communities have been stopped. But the use of IEDs has assumed a different proportion." "Personally, I don't support the devaluation of the Naira. We handed over a secured country in 1979, but by 1984, nobody knew how much Nigeria was owing. "The situation now is aggravated by the downturn in the petroleum industry. It is now per barrel and we have debt service of about N1.5 trillion and we have commitment on the ground. "We have to reorganize the NNPC. We have to introduce the TSA. There were 45 accounts in the NNPC alone. Ministry of Defence had about 70 accounts. "We have got about N1.5 trillion through the TSA. "The oil downturn is very unfortunate for this government. "Check previous records. Over 90% were recurrent. No country can develop without capital projects. We were in very very bad shape." "I will not support devaluation of the Naira. I need to be convinced that there is need for the country to devalue the Naira. Is it against the dollar or pound? "We have our priorities. To provided money to fund the projects we have already outlined, and not for those who want hard currency to import textile and toothpick." "By the end of next quarter, you will not be talking of subsidy. The price is so low that there is no need to subsidise anything." "Previous government failed to maintain four refineries, pump stations and pipelines, at a time Oil was sold at over..."
"Our priority now is to get our refineries working. By the time we finish what we are doing., 60 per cent of the allocation of crude oil for local refining and 40 per cent would be used for crude oil swap." "I turned down a N400million car proposal for the presidency. I said the cars I have are good enough for 10 years. We are having problem with the National Assembly regarding TSA. I have to holding a closed-door meeting with the National Assembly regarding the cars they are trying to buy. I hope they haven't bought them yet. They can't buy cars for themselves and also take money in car loans." "Foreign exchange will be made available to the productive sector of the economy and not for luxury items." "The Minister of Finance and the Central Bank have to sit down immediately to look at ways to help students who are already outside the country to overcome the challenges posed by the foreign exchange limitation policy." "If you see the atrocities those committed against this country, we can't allow them to jump bail." "Most government officials are new in office. We said Agriculture and Solid minerals are the easiest way to get people employed and our budget would show that. "We have virtually all forms of solid minerals across Nigeria. "We would employ youth, give them crash programme on Education and send them to teach at Primary schools. "Fashola was not made a super Minister for nothing." "China agreed to pay 70% of cost of railway projects between Lagos and Kaduna and Lagos and Calabar, but previous government failed to pay counterpart funding of 30%. "You cannot get a better deal anywhere in the world. "I can't see the National assembly paying 4.5 Billion Naira to buy cars after collecting transport allowance. I will revisit that story. "We have to live within our means." "The process of government agencies earning monies and spending them and giving government change will have to stop. All government monies have to be paid to the Federation Account and a budget submitted for their operations." "Our parastatals would be realigned in view of the lesser number of Ministries we have now. "We are being economically stretched." President Buhari appeals to Nigerian journalists to do more investigative journalism about important national issues.